Experience breathtaking panoramic views of the city of a thousand spires. We will ride to Letna and Petrin parks as you make your way toward the famous Prague Castle and back through the New Town. Our Panoramic & Prague Castle Bike Tour overlooks Prague from a high vantage point, providing excellent photo opportunities and serving as a perfect backdrop for the broad history of this magical city. After riding along Prague's Vltava River you can soon find yourself riding on the hillsides of Letna and Petrin parks with a visit to the glorious Prague Castle, the World's Largest Castle Complex. Then wind your way through the New Town towards Wenceslas Square: birthplace of the modern Czech revolutions. In just a few hours, you'll know Prague in a way that is not possible without a bicycle! 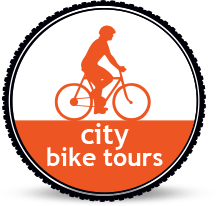 Our Panoramic Bike Tour is designed to complement the Classic City Bike Tour. Each tour offers different views and unique perspectives. Together, both tours will give you the complete Prague experience while offering a best way to see this magic city. Note: Use of regular & electric bikes are allowed for the same tour. The tour goes at an easy and not a fast pace and using an e-bike will not make you go faster but makes the trip easier. BIG PRAGUE E-BIKE TOUR - "ALL IN ONE"
At Praha Bike, your safety is our priority! Our quality bikes are well-maintained, comfortable and made for riding in Prague. The tour moves at a comfortable pace so that everyone can enjoy the sights. Our well-planned routes manage to avoid tourist crowds and high traffic areas. We stay on side streets, bike paths and ride in green area and parks. Helmets are always recommended but are not obligatory for those over 18 y.o. (in accordance with Czech law). Guest must be able to ride a bike, no training is provided except how to control breaks & gears on bicycle or e-bike. All tours start and finish at the Praha Bike main office located just 200 meters away from Prague's Old Town Square at Dlouha 24, Prague 1. We provide most of our tours in English (except where noted). Additional languages are available upon request. Rain or shine - All our tours operate every day. We have sunscreen, rain ponchos or warm gloves available before the tour. please EMAIL, CALL or send TEXT/SMS to make a reservation. If you cancel between 48 and 24 hours in advance of the scheduled departure, there is a 50 percent cancellation fee. Praha Bike gives 90% refunds if the reservation is cancelled more than 7 days prior to the scheduled tour. Praha Bike gives 50% refunds if the reservation is cancelled more than 2 days but less than 7 days prior to the scheduled tour. Praha Bike does not offer refunds if reservation is cancelled less than 2 days prior to the scheduled tour. REFUND POLICY: If you are not happy with the tour we will gladly refund you money or offer you an alternative tour.